KY-8 is a bumpy ride, and the fuel truck driver who crashed there Friday narrowly avoided tragedy. VILLA HILLS, Ky. — River Road re-opened late Friday night after a fuel truck crash forced a nine-hour closure and a brief shelter-in-place advisory for nearby homes and businesses. The truck was carrying 7,200 gallons of marine fuel westbound at 1:55 p.m. when it went off the road in soft dirt in order to avoid an oncoming dump truck that was over the center lines, Villa Hills police Sgt. Matthew Hall said. The driver was trapped for a time but has been freed by firefighters. Officials said his injuries were not life-threatening. "This is the best outcome we could possibly have in this situation," Hall said. "When the tractor did rotate and flip on its top, the passenger side of the cab is completely demolished against the ground. Had he flipped on the other side, been on that side or had a passenger, we'd have had a much sadder scene." Although police had not linked road conditions to the crash, Hall acknowledged River Road has been beset with problems. The span is pocked with potholes and faces yearly erosion from the movement of the river that gives it its name. 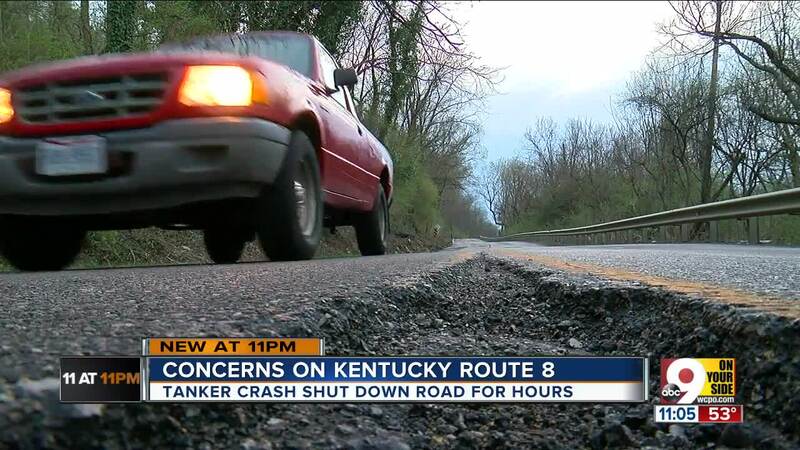 As Kentucky Transportation Cabinet branch manager Mike Bezold said while discussing a different stretch of the same route in February, a battle of water-versus-road is one with a forgone conclusion. It also comes with a hefty price tag — one the state legislature has balked at taking on.